T B A est une jeune agence d’architecture Montréalaise axée sur le design contemporain. 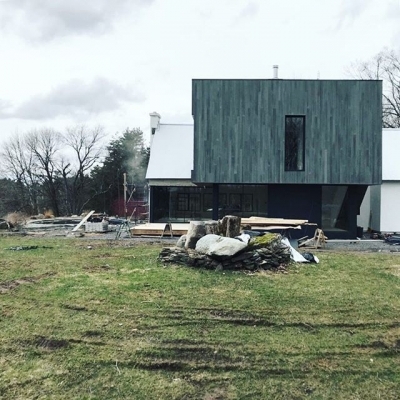 T B A is a growing architecture studio based in Montréal, focusing on custom, contemporary design. 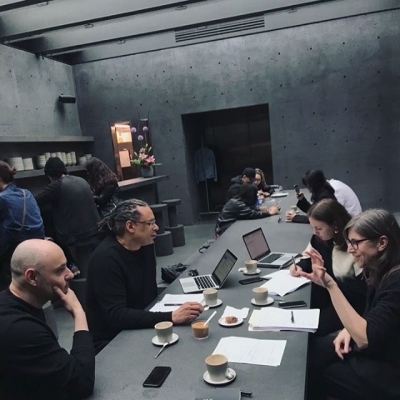 We are excited to announce that Impostor Cities, a collaborative proposal under the umbrella of T B A + David Theodore, will be Canada’s official representation at the 2020 Venice Biennale in Architecture! 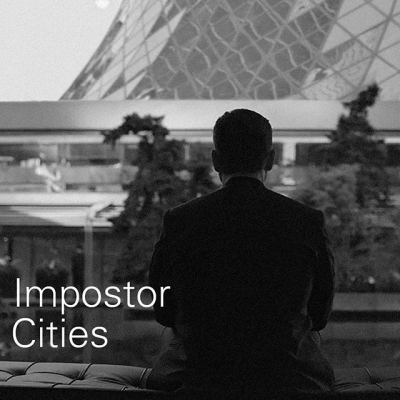 A huge thanks to the Impostor Cities team, and our congratulations to the other teams for their shortlisted proposals – it was stiff competition. 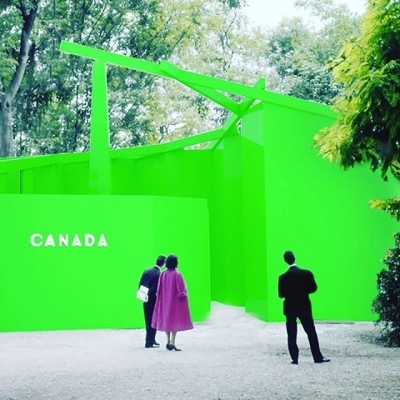 Canadian participation at Venice is coordinated and generously supported by the Commissioner, the Canada Council for the Arts. Check out the official announcement for more information about the Biennale and keep an eye on impostorcities.com in the upcoming months. 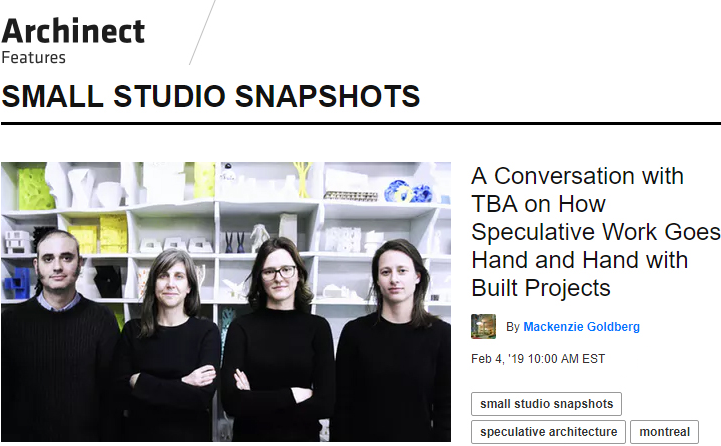 We had the pleasure last week of being interviewed for Archinect’s Small Studio Snapshots. The weekly series investigates the ins and outs of running a small architecture practice. Hôpital Vétérinaire du Parc made Kollectif’s project of the month. Hôpital vétérinaire du Parc picked up an award this week in the Institutional, Cultural, Public and Health Facilities category at the 12th edition of the Québec Grands Prix du Design. 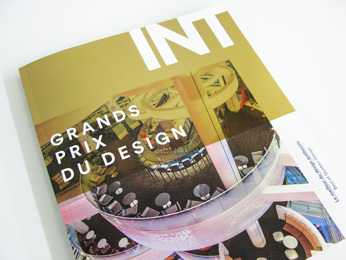 Hôpital vétérinaire du Parc and the evening’s other winners appear in the current issue of Intérieurs Magazine. We are extremely honoured to be selected by the Canada Council for the Arts as one of the four shortlisted candidates to represent Canada at 2020 Venice Biennale in Architecture. 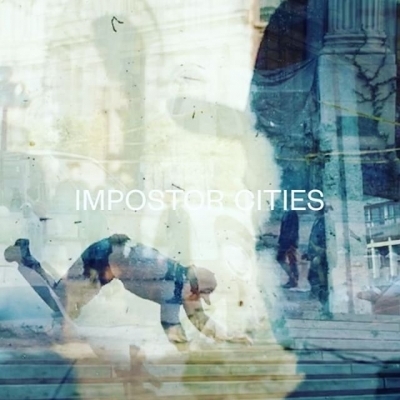 Impostor Cities, a collaborative proposal by T B A + David Theodore, probes the complex identity of Canadian architecture by exploring the portrayal of our built environment onscreen. 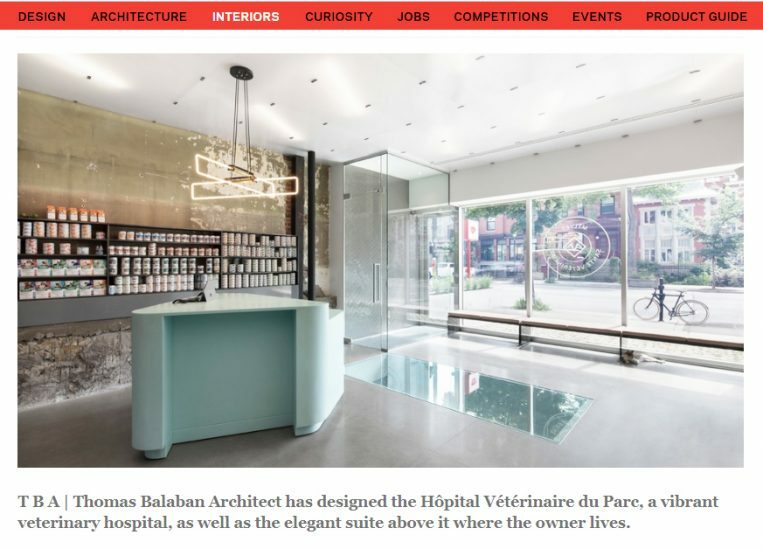 Hôpital Vétérinaire du Parc is receiving some nice online press with features in Deezen, Archdaily, Design Milk, as well as a few other local and international sites. It is nice to see the project touring the web. Azure online published a nice article on Parc Av / HVdP this week. We’re very happy to see this tricky intervention getting some press. Article featuring TBA’s Hôtel Mile End in September’s issue of the magazine. Philippe Lupien writes on the importance of private competitions for up and coming offices as a means of acquiring commissions currently out of reach in the public competition system that favours only a few established offices. 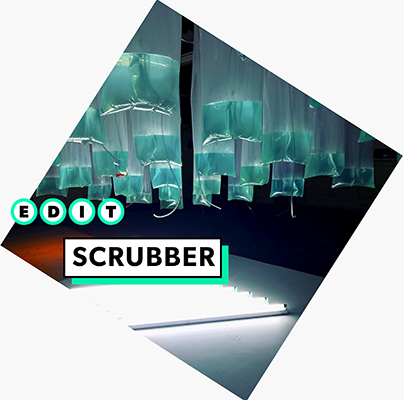 TBA’s DIY algae bio-reactor “Scrubber” makes Azure’s Best of EDIT list. The future is small! Opening event tonight for EDIT at the old Unilever factory in Toronto. 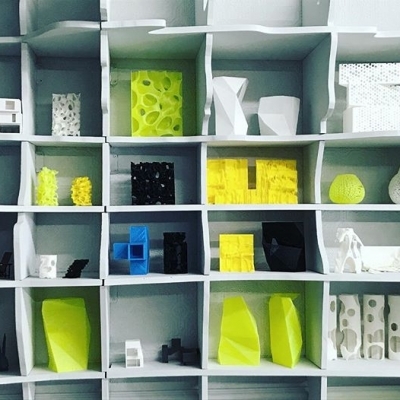 Put on by the Design Exchange and the United Nations Development Programme, the curated exhibition features projects, talks, installations, and workshops in technology and design that are making the world a better place. We are very proud to have been selected to show our work among the humbling array of projects. Our installation’s 160L of micro-algae will produce enough oxygen for a household of 4 active people and 80kg a year of not-so-tasty superfood. The exhibition is now on until October 8, 2017. Come by tonight to see our temporary installation at the Ontario Order of Architects’ MOVE event. 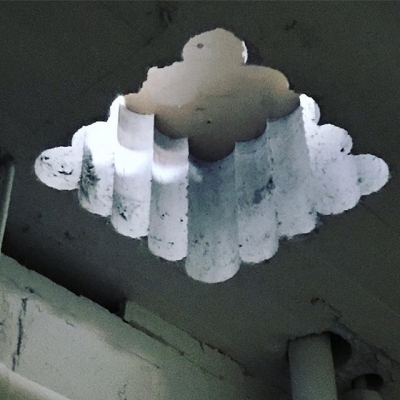 Our tongue-in-cheek installation celebrates nature’s spectacular ability to instantly repatriate the places we leave behind. 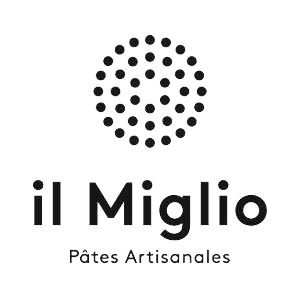 Il Miglio Pâtes Artisanales is now open! 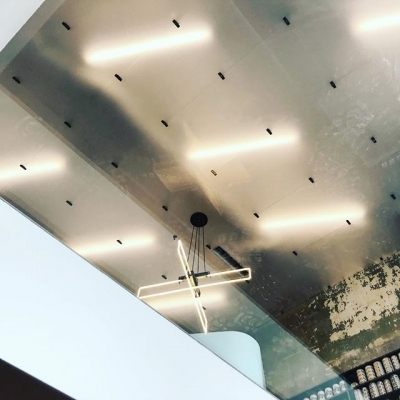 TBA collaborated with the fine folks at Il Miglio on the design of this new 30 seat cantina style lunch spot in the Mile End. 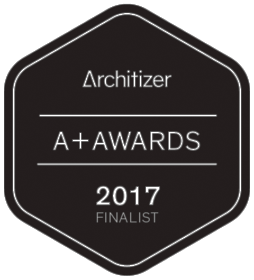 House on Helby Island has been selected as a Finalist in the Architizer A+ Awards. TBA is proud to be part of a select list of Canadian talent in an impressive lineup of established and up-an-coming international firms. 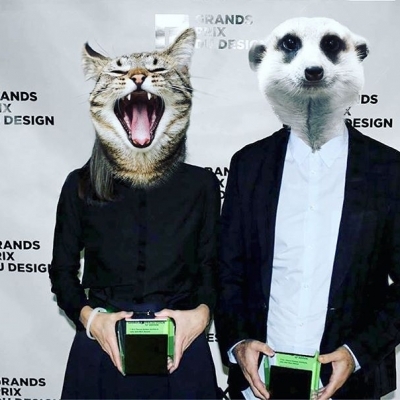 Our design for the Musée des beaux-arts de Montréal picked up the exhibition design award at the 10th edition of the Québec Grands Prix du Design. Last two weeks to catch the TBA designed retrospective of photographer Robert Mapplethorpe at the Musée des beaux-arts de Montréal. The show closes January 22, 2017. 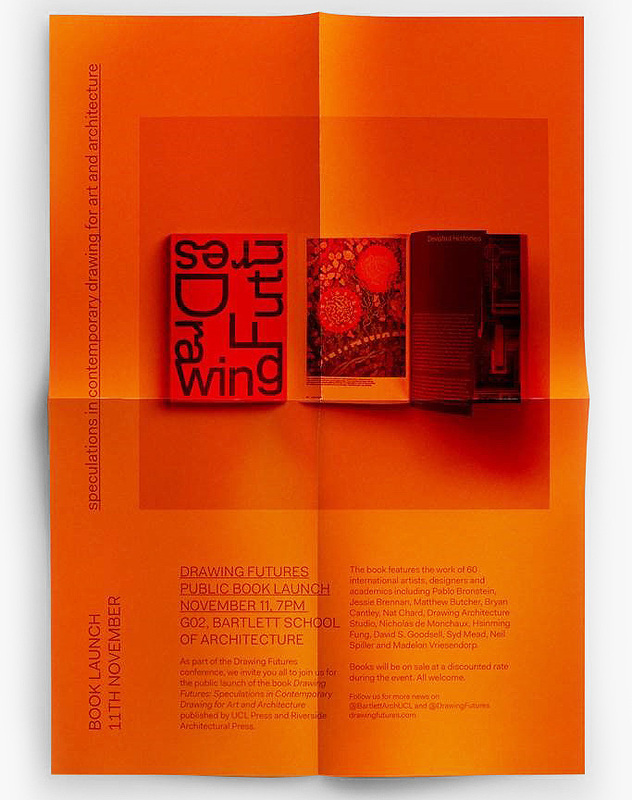 Drawing Futures book is now out on UCL Press and Riverside Architectural Press. TBA is very proud to be part of a publication that brings together international practitioners examining how drawing is changing in relation to new technologies. 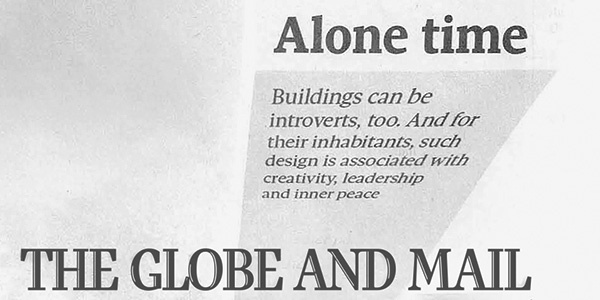 Holy Cross was featured today in Matthew Hague’s article about the many advantages of inward looking spaces. We are honoured to be part of CANADIAN ARCHITECT‘s feature on 14 of Canada’s emerging architecture firms. The list is far too short ! A big thanks to Elsa Lam and Sarah Fletcher for the nice article. TBA’s UNDO Project selected to appear in the Drawing Futures book published by UCL Press. Drawing Futures is a new international conference on speculative drawing for art and architecture. It will bring together practitioners from many creative fields to discuss how drawing is changing in relation to new technologies. 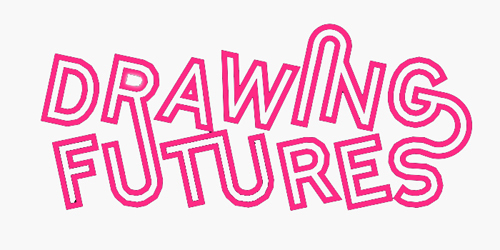 In its inaugural year, Drawing Futures 2016 will be held on the 11th-12th November 2016 at the Bartlett School of Architecture,UCL in London. 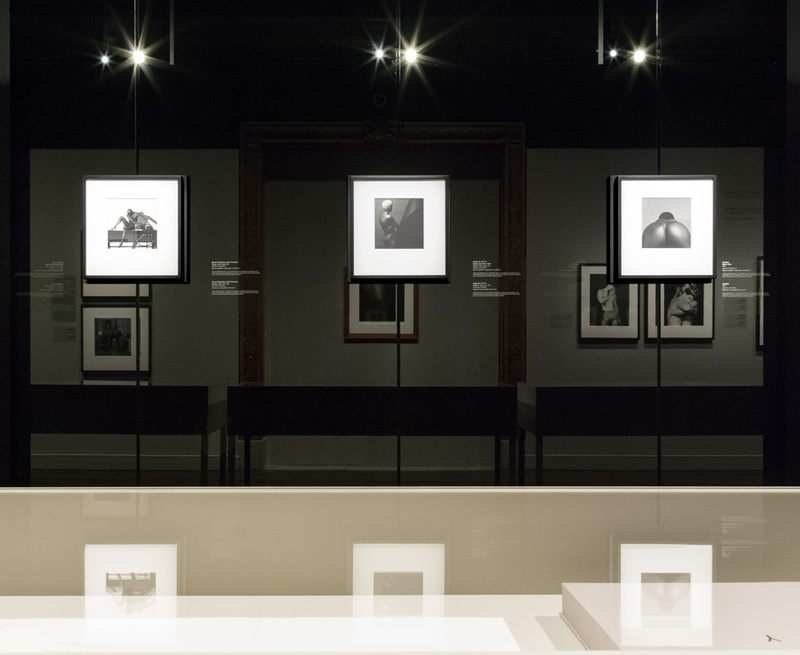 TBA selected to collaborate with the Musée des beaux-arts de Montréal on this fall’s blockbuster retrospective of photographer Robert Mapplethorpe. The exhibition is slated to run from September 10, 2016, to January 22, 2017. Montréal jamais construit, 1990-2015 closed today. We’d like to thank everyone who visited the show’s four month run and in particular the team at the Maison de l’architecture du Québec for hosting and collaborating on the exhibition. We would also like to thank the Canada Council for the Arts for their financial support. This is the last weekend to catch Montréal jamais construit, 1990-2015, at the Maison de l’architecture du Québec. 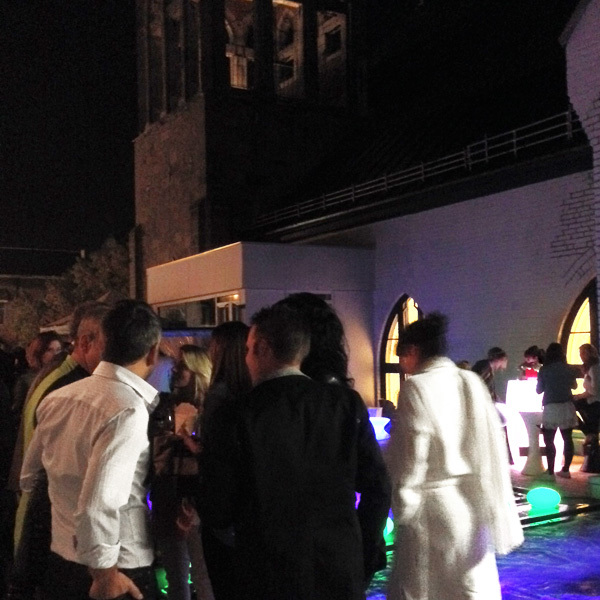 The exhibition closes with the second edition of Perdants Maqnifiques at the Lion d’Or. TBA will present our competition entry for the Metamorphosis of the Insectarium at Montréal’s Espace pour la Vie and the Helby Island House. The evening’s other presenters include Jean Beaudoin (Intégral Jean Beaudoin), Frédéric Dubé (Lapointe Magne et associés), Philippe Lupien (Lupien + Matteau architecture), Sergio Morales and Stephan Chevalier (CMA), Hubert Pelletier (Pelletier de Fontenay), Érick Rivard (Groupe A / Annexe U), and Pierre Thibault (Atelier Pierre Thibault). 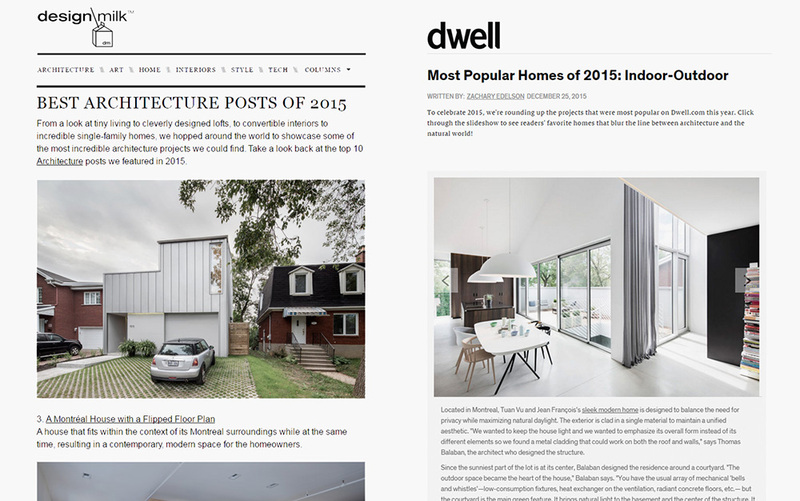 The year ended nicely with Holy Cross making Dwell and Design Milk’s Best of lists for 2015 ! 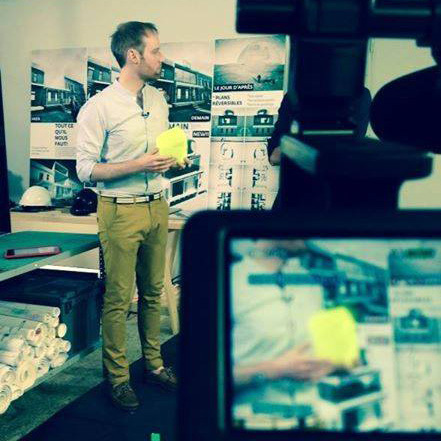 Follow us for news and snapshots of what’s going on around the studio. A big thanks to all who showed up and participated in tonight’s heated debate on the future of Montreal’s housing stock ! 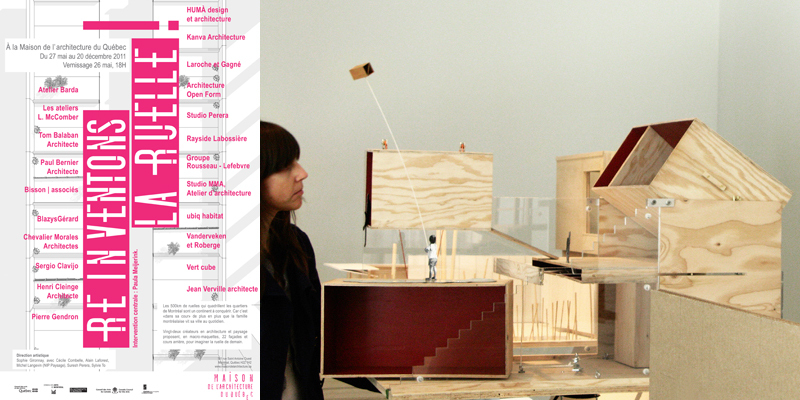 The Plateau 2.0 exhibition is now open – Mondays to Fridays 9am-5pm at the McGill School of Architecture Gallery. 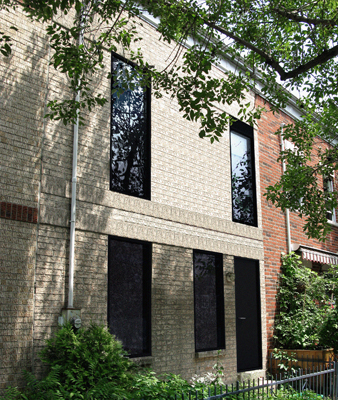 The group exhibition showcases recent residential projects on the Plateau. 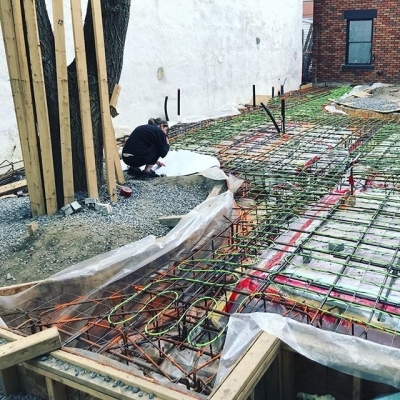 Vernissage tonight at 5pm, followed by the discussion panel Rebuilding the Plateau at 6pm with TBA’s Tom Balaban, Lisa-Marie Fortin (Thellend Fortin Architectes), and Stéphane Rasselet (_naturehumaine architecture & design). The discussion will be moderated by Marc-André Carignan. We have been very busy the past few months but we thought it would be worth taking a break to mention that Montréal jamais construit, 1990-2015, an exhibition curated by TBA at the Maison de l’architecture du Québec will be opening tonight ! The exhibition features 13 unlucky, unbuilt architecture projects from 12 Montréal offices…and one Dutch firm. 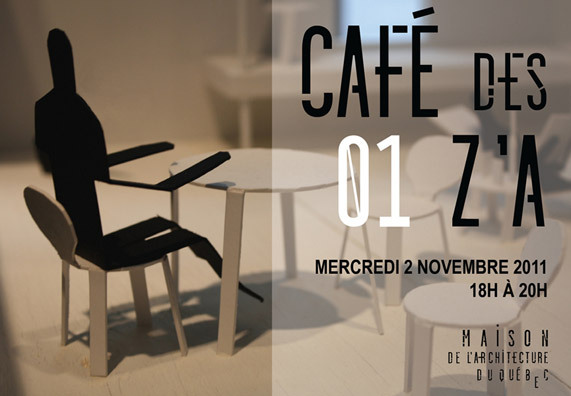 The vernissage will take place tonight (Thursday, October 22) from 6:00pm to 9:00pm at the MAQ. The exhibition will run until the 14th of February, 2016. 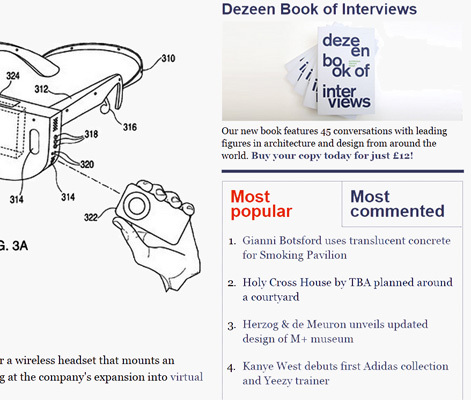 The internet’s funny algorithms gave us our 15 minutes of fame this week on Dezeen. Fleeting, but fun. The project also appeared on ArchDaily, MOCO LOCO as well as a few other local and international sites. Dwell online put out a nice article on Holy Cross this week. It is good to see the project travelling around on the web. 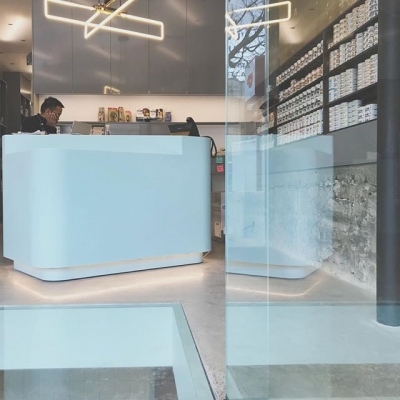 Le Saint-Jude is featured on this week’s episode of Archi branchés. This fourth installment in the series hosted by Marc-André B. Carignan talks about the office, the project, and opens up the discussion on the fate of our religious architectural heritage. Previous episodes have focused on Dan Hanganu`s Bibliothèque Marc-Favreau, Claude Cormier`s la Plage de L’Horloge, and Smith Vigeant`s Allez-UP Climbing Center – all worth watching. 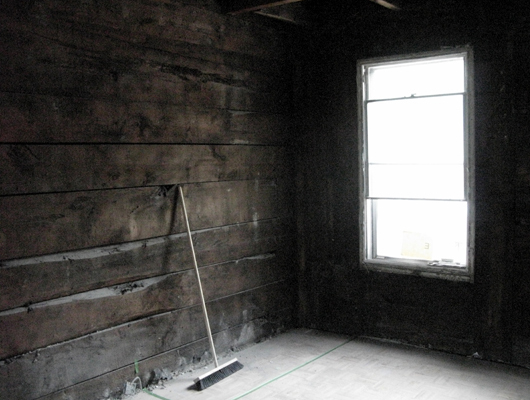 Holy Cross picked up the Residential space 1,600 to 3,200 sq.ft. 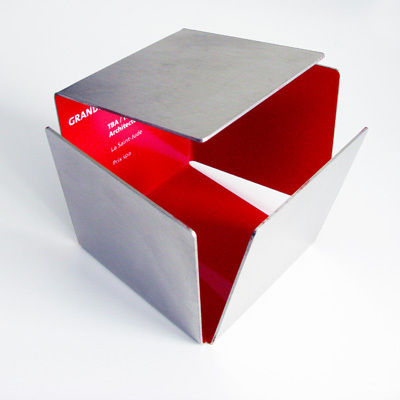 award at the 8th edition of the Québec Grands Prix du Design. Holy Cross and the evening’s other winners will appear in the February issue of Intérieurs Magazine. 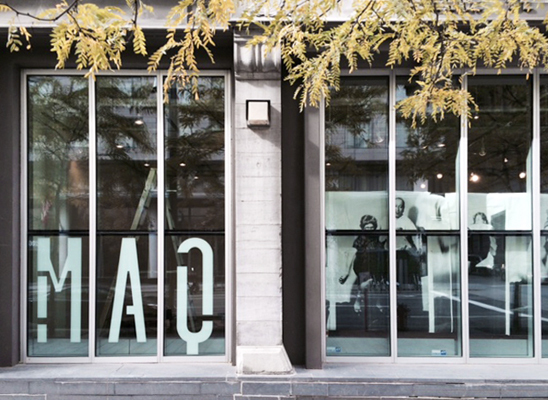 T B A was awarded a 2014-2015 Conseil des arts et des lettres du Québec Research and creation grant for the project Québec jamais construit. The project will be shown at the Maison de l’architecture du Québec in the fall. Stay tuned ! Our competition entry for the Insectarium at Montréal’s Espace pour la vie made it onto Mark Magazine‘s Oct/Nov Notice Board. Here are drawings of a decorative wall for a small renovation we are currently working on. The bas-relief is based on work from our Undo Project. It is milled out of birch plywood panels. In diesem Monat wurde Saint Jude erschien in der Veröffentlichung AIT-Architektur/Innenarchitektur/Technischer Ausbau . 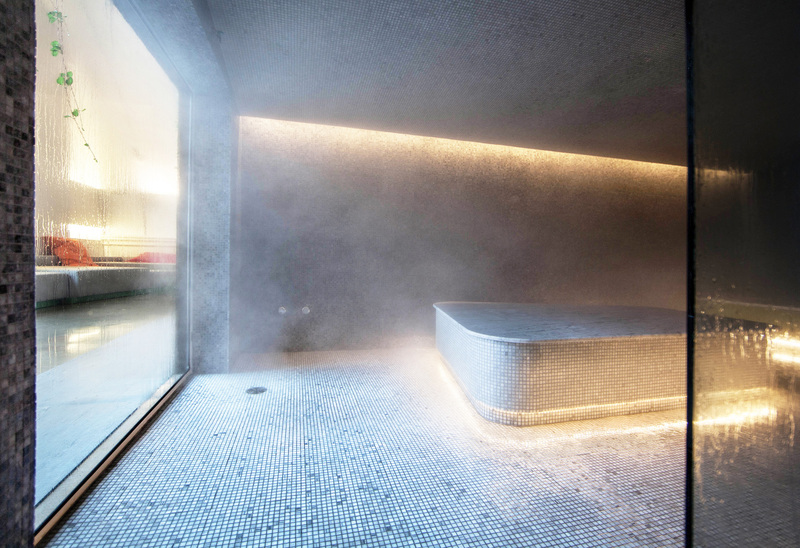 Le St-Jude was among the winners of Canadian Interiors BEST OF CANADA annual design awards. The project picked up an award in the program’s Hospitality category. People seem to like our stairs. 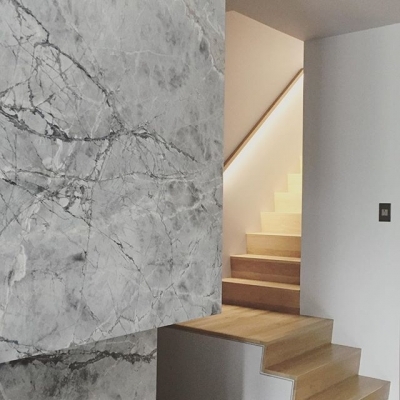 Images of the main stair have been on the Archinect Top Ten Images “Stairs” Pintrest Board for the past few weeks. with Adrien Williams this week. Images to come. Le St-Jude made Kollectif‘s picture of the month. Some progress images of a light fixture bracket we are developing. The form was established through structural analysis and optimization. It’s not the prettiest thing but we’re working on it. Pure cuisines turned it up to eleven for our kitchen at Holy Cross. With an event held today at Le Saint-Jude the Conseil du patrimoine religieux du Québec announced the publication of a series of booklets highlighting six exemplary church transformations. Le Saint-Jude was one of the selected projects. 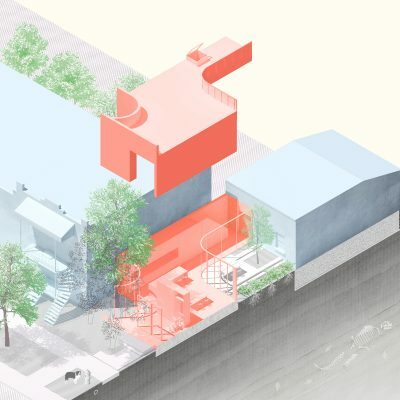 The initiative aims to encourage the realisation of other promising projects for the development of Montreal and the preservation of its identity. Marc-André Carignan and the Archi branchés crew invaded the studio this week to talk about Le Saint-Jude. 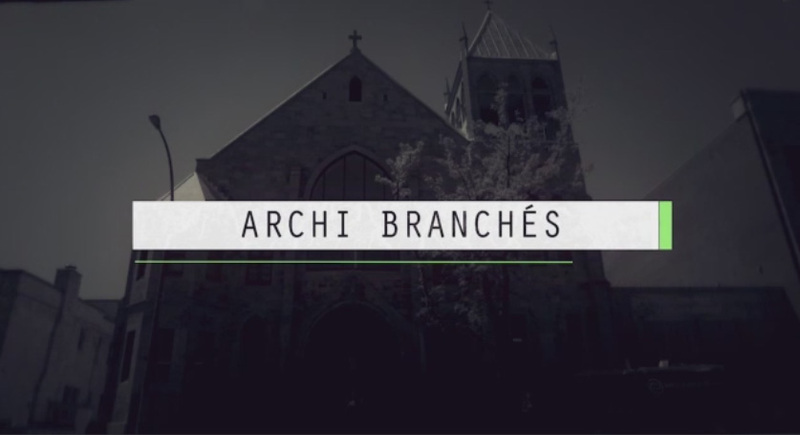 Each episode of Archi branchés is devoted to an architect and a tour of his/her latest project. TBA was honoured with one of the episodes in the show’s inaugural season. 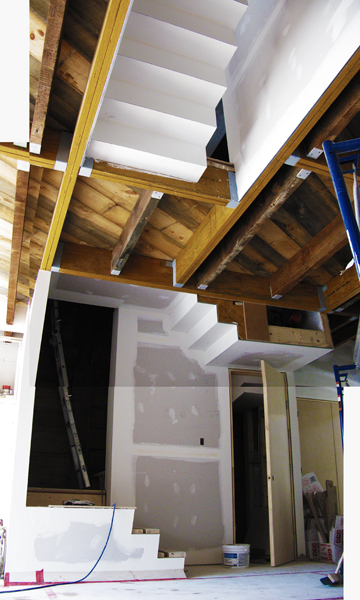 Le St-Jude and Alma Street make the Archinect Top Ten Images on their “Stairs” and “Architect Sure!” Pintrest Boards. kitchen featured in MontrealHOME‘s Kitchens issue. In April TBA will move into its new office space located at 34 Beaubien Ouest. It’s nice to be back at street level. 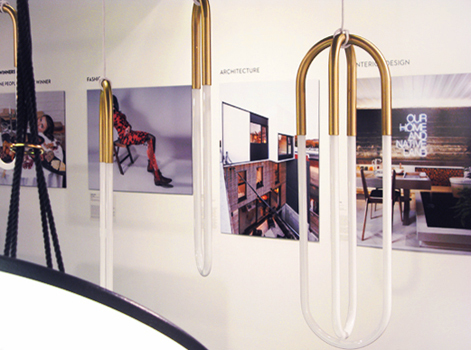 Alma Street project at the Design Exchange in Toronto as part of the Emerging Designer Competition exhibition, on until May 1, 2014. 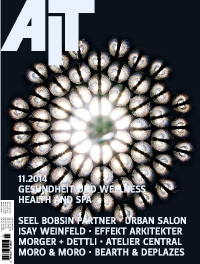 Le St-Jude appeared on ArchDaily and in World Interiors News this week ! 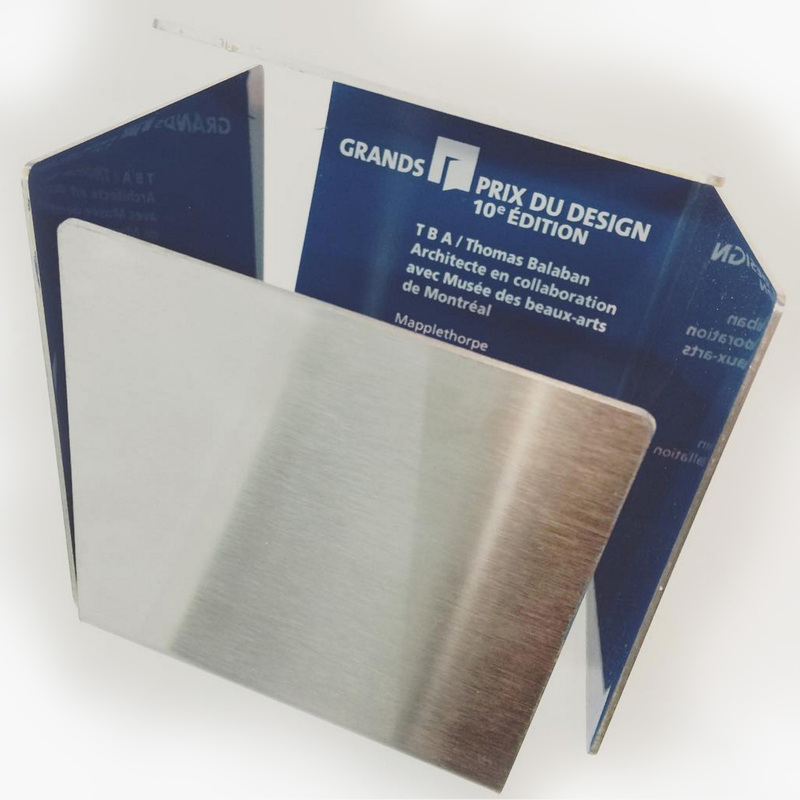 Le St-Jude picked up a 2013 Québec Grands Prix du Design award in the hotel and recreational facility category. Le St-Jude and the evening’s other winners will appear in the February issue of Intérieurs Magazine. Congratulations to TBA’s Jennifer Thorogood who was selected as the winner in the architecture category of the DX / RBC Emerging Designer Competition! 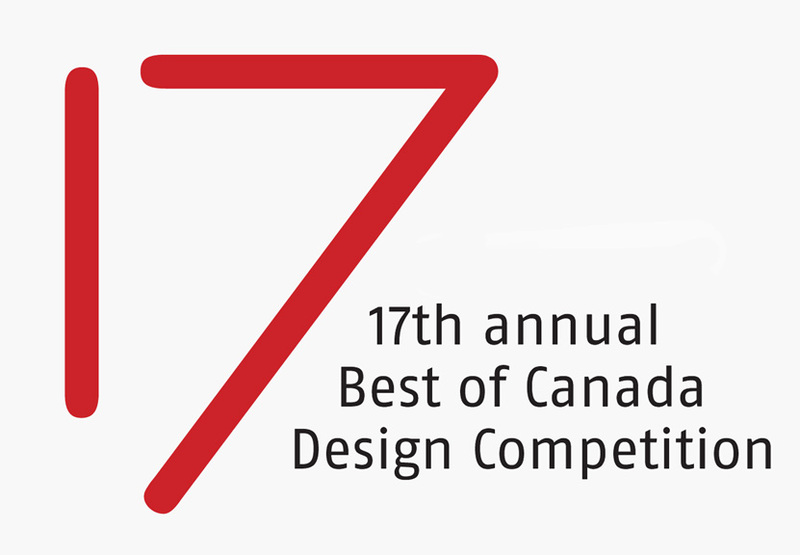 The national competition seeks to recognize up-and-coming Canadians across all design disciplines. 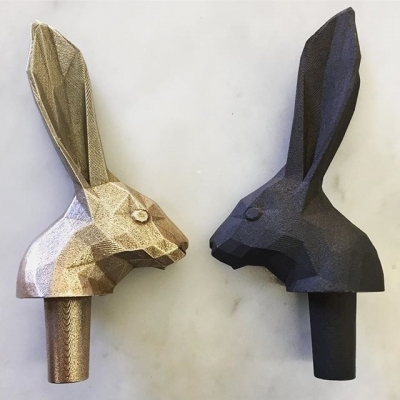 It was juried this year by Douglas Coupland, Heather Reisman, and Marcel Wanders. 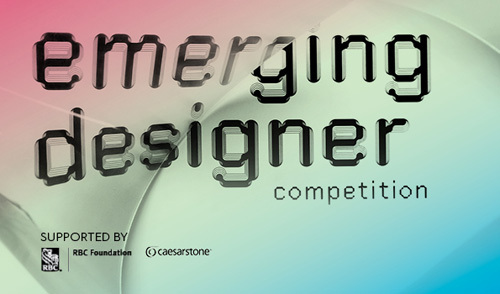 The winning work will be on exhibit at the Design Exchange in Toronto from February 21 to April 1, 2014. The project has also been getting more love on Architizer’s facebook page than the upside down plywood play structure for cats ! 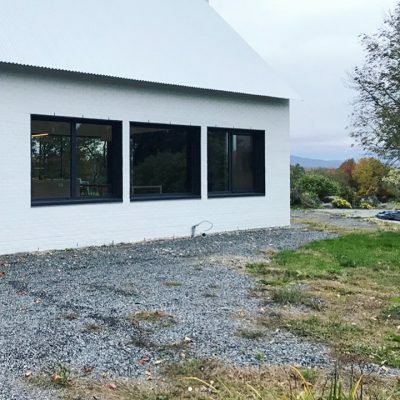 TBA is moving in January. Our temporary address is 7022 Waverly until we move into our new space. 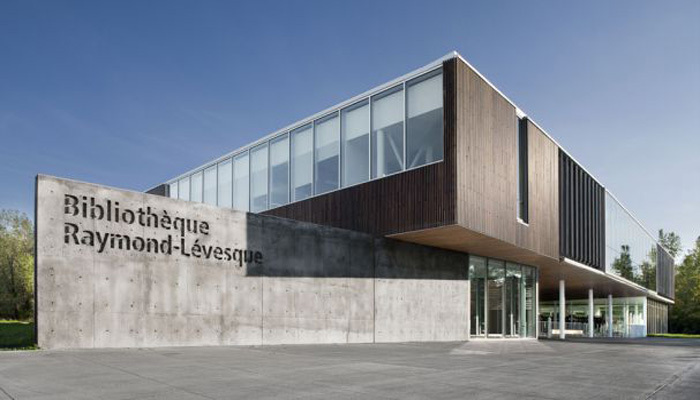 Atelier TAG+JLP‘s Raymond-Lévesque Library received an OAQ Prix d’excellence 2013 in the institutional building category. 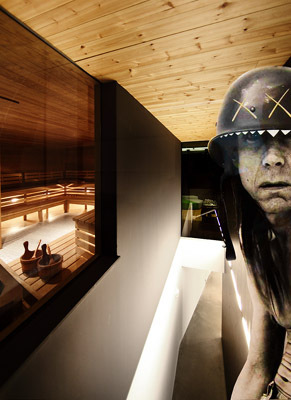 Tom Balaban participated in the competition winning scheme and production for the project as a designer at Atelier TAG. The library garnered a Canadian Architect Award of Excellence in 2009. Le St-Jude features prominently in Karen Johnson’s article on Montreal’s trailblazing church conversions. The prefab structure up ! The second iteration of our St-Jude Water Lamp is taking shape. 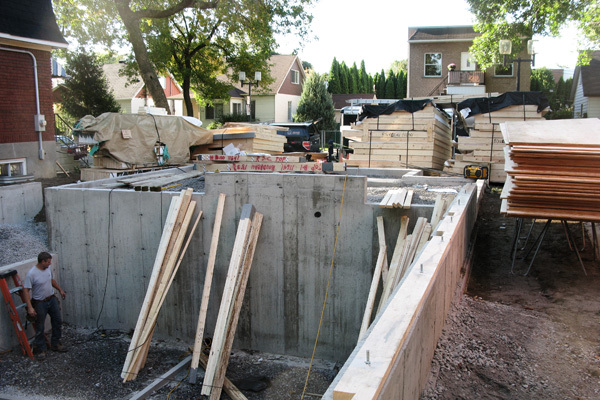 Foundations are poured and the prefab wall panels have arrived on site. 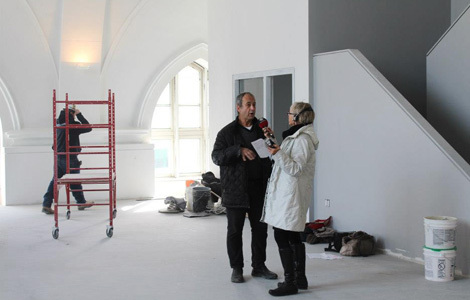 Le Saint-Jude Espace Tonus has been receiving some nice coverage in the press in the last couple of weeks with articles in Le Devoir, Journal Métro, La Presse, Plaisirs de vivre, among others. The first pieces of the St-Jude Water Lamp are putting our 3d printer through its paces. Tony Attanasio speaks to Jeanette Kelly about Le St-Jude on CBC.ca’s Cinq à Six . as part of the ”Pratiques controverses” series organised by L.E.A.P. and the École d’architecture. 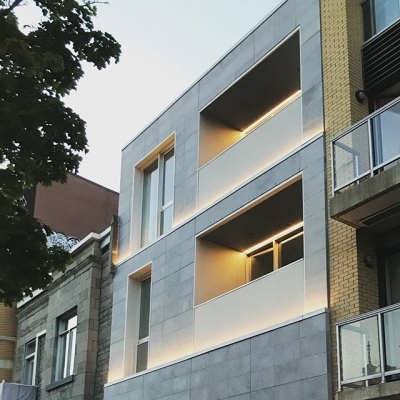 Le St-Jude received one of nine Canadian Architect Awards of Excellence at the 45th edition of the national awards program and Bruce Haden (DIALOG). The award is given annually for architectural design excellence to significant building projects in Canada. The Canadian Architect Award is only one of two national awards devoted exclusively to architecture. 2×1000 and Lalonde-Gadoury appear in volume 2 of Line Pomerleau’s compendium of contemporary residential architecture in Québec. 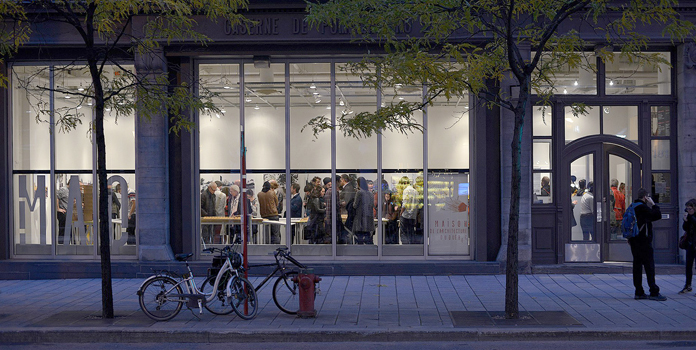 Atelier TAG‘s Raymond-Lévesque Library picked up the first Facteur.d award in architecture. The new awards program is focused “on showing companies and public organizations the economic and social benefits of investing in quality architecture, design and planning”. Separated at birth? 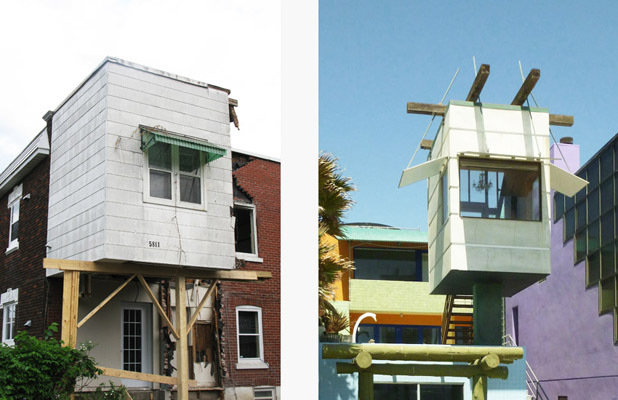 Bannantyne vs. Frank Gehry’s Norton House. 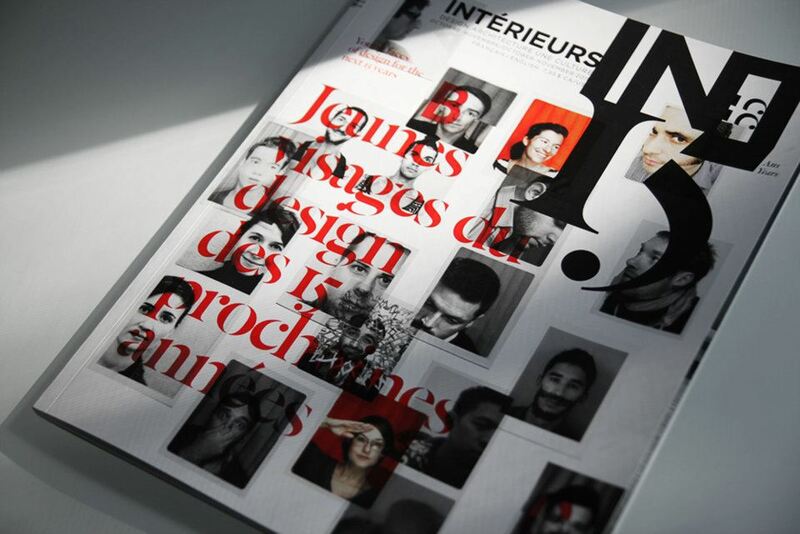 TBA’s Tales of Tomorrow is on display in the “Jeunes visages du design” section at this year’s Salon international du design de Montréal. 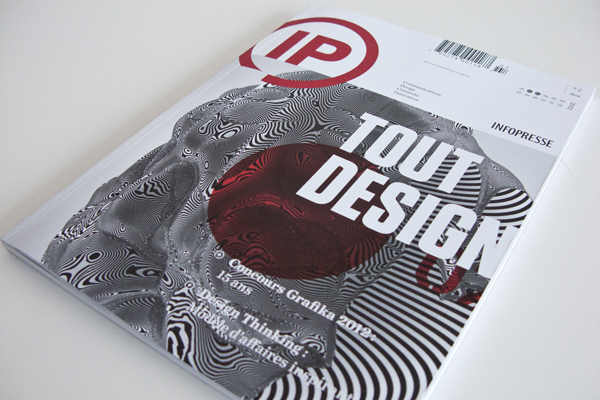 Article in this month’s edition of Infopresse about our interior for Houlala Communications. TBA receives a nice spread in the exhibition catalog documenting the work of some of Canada’s most innovative and new design and architectural firms. Tom Balaban chosen to be among the “young faces of design for the next 15 years” for the magazine’s 15th anniversary issue. Round table discussion tonight on the topic of the Réinventons la Ruelle ! exhibition. 6:00pm-8:00pm at the Maison de l’architecture du Québec . Also speaking will be Paul Bernier, Maxime Gagné et Dominique Laroche (Laroche et Gagné), Suresh Perera (Studio Perera), and Vouli Mamfredis (Studio MMA). Peter Fianu will moderate the event. 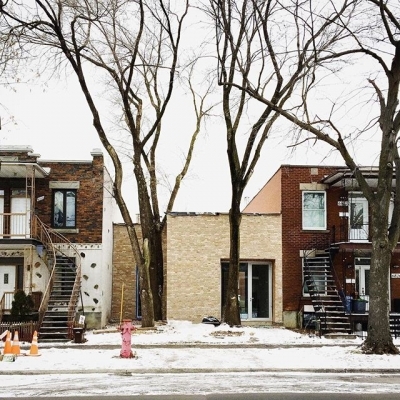 Article on 2X1000 and ALEXANDRA STREET HOUSE projects in issue dedicated to the Marconi / Alexandra district, dubbed “Le quartier des architectes” by the magazine. 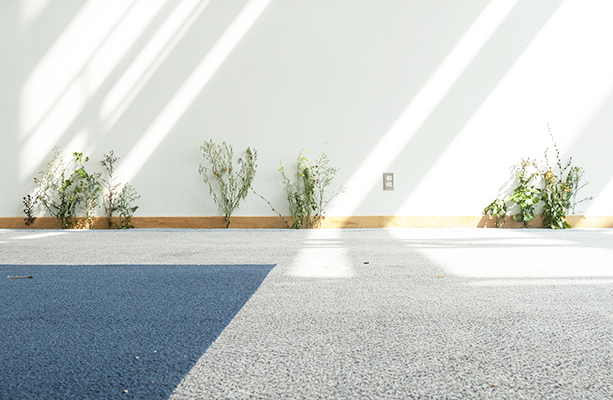 Group exhibition of emerging Canadian practices is now showing in the public gallery spaces of Toronto’s Harbourfront Centre. The show will run from Saturday, November 06, 2011 and is scheduled to travel across Canada in 2012. Lalonde-Gadoury Residence featured in Lucie Lavigne’s article “Comment attirer la lumière” in the October 29 edition of Ma Maison in La Presse. 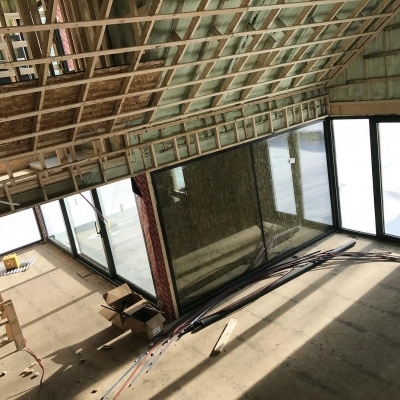 Work has begun on the interior of the church of Our Lady of the Rosary and of Saint Jude. new space is under construction. 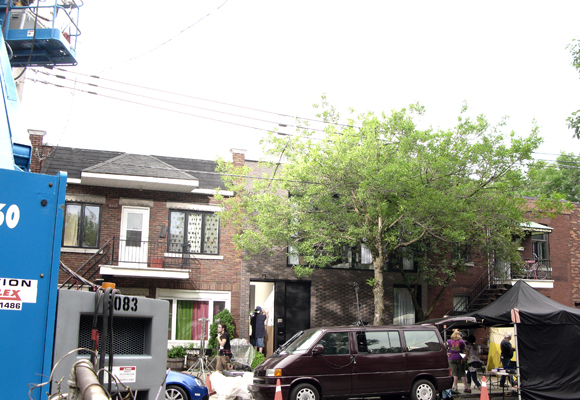 episodes from the third season of Radio-Canada’s TRAUMA television series shooting on location at 2×1000. 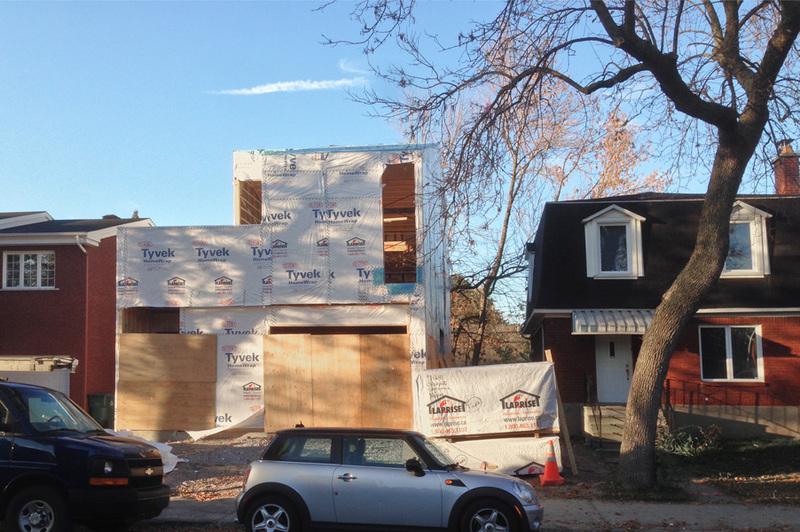 rear façade is coming along. 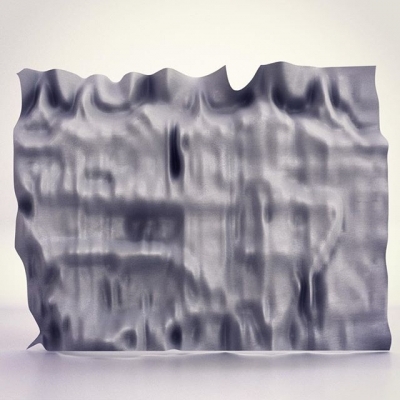 UNDO selected for 2D3D-2, a group exhibition examining the status of architectural drawing in the post-digital age, from April 14 through May 1, 2011 in Los Angeles at WUHo, Woodbury University’s center for experimental exhibitions and multi-disciplinary collaborations. T B A was selected for the third edition of Twenty+Change curated by Marc Boutin, Larry Wayne Richards, and Talbot Sweetapple. The Twenty+Change exhibition and publication features emerging Canadian practices that push the boundaries of their discipline. 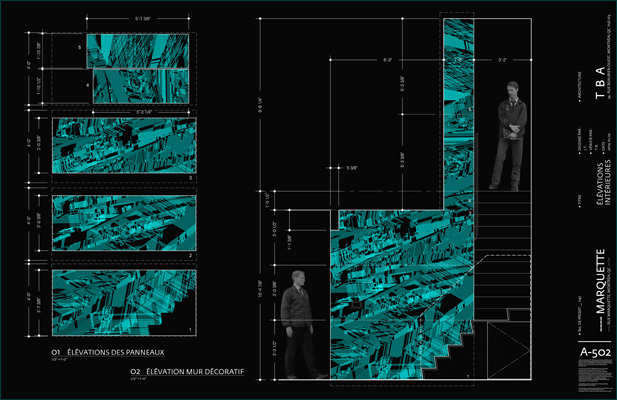 T B A will participate in the upcoming group exhibition Réinventons la Ruelle from May 20 through October 29, 2011 at the Maison de l’architecture du Québec in Montréal.